Cadmium (Cd) is a highly toxic environmental and industrial cumulative pollutant that affeets many organs, especially the liver. 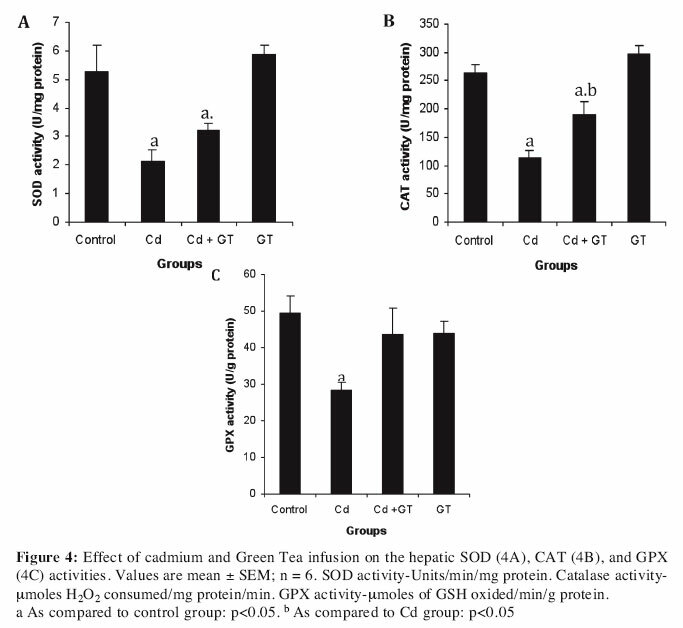 The present study was designed to evalúate the antioxidant effect of green tea on cadmium-induced hepatic dysfunction and oxidative stress in rats. Adult male Wistar rats were administered cadmium by injection of 20 emoles /kg bw/ every 3 days for six months. This study revealed significant (p < 0.05) liver dysfunction, lipid peroxidation and a decline in antioxidant enzyme activities in the liver of cadmium-treated rats compared to control animáis. Compared to control rats, the activities of lactate dehydrogenase (LDH), gammaglutamyl transferase (GGT), acid phosphatase (PAC), phosphatase alkaline (PAL), as well as bilirubin and thiobarbituric acid-reactive substances (TBARs), were significantly (p < 0.05) increased in Cd-treated rats. Moreover, antioxidant enzyme activities, such as superoxide dismutase (SOD), glutathione peroxidase (GPX) and catalase, were significantly (p < 0.05) decreased in the liver of cadmium-treated rats. The oral administration of 5% aqueous green tea extract, along with cadmium treatment for six months, caused a significant (p < 0.05) improvement in cadmium-induced toxicity by significantly decreasing (p < 0.05) the activities of enzymatic markers of liver dysfunction (LDH, GGT, PAC, PAL activities, as well as the bilirubin rate). 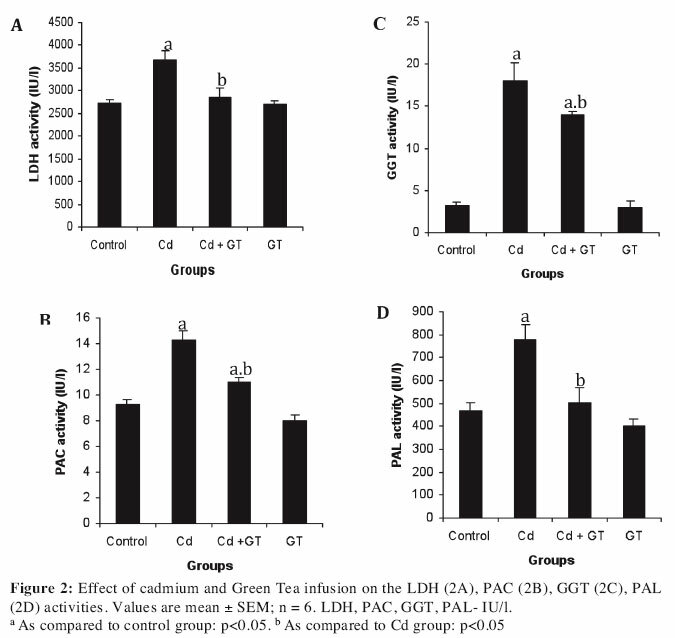 Indeed, green tea extract significantly increased (p < 0.05) antioxidant enzymatic activities (SOD, Catalase, GPX) in rat liver, compared to those given cadmium alone. Thus, the oral administration of green tea, along with cadmium significantly (p < 0.05) improves cadmium-induced liver dysfunction and stress oxidant in rats' liver. Key terms: cadmium; rat liver dysfunction; green tea, antioxidant enzymes, lipid peroxidation. Cadmium (Cd) is a heavy metal with great environmental health effects and all Cd compounds have been classified as human carcinogens (Newairy et al, 2007). Cadmium is used industrially to manufacture electro-plates, batteries, alloys and fuels (Waisberg et al., 2003). The increasing industrial use of Cd causes soil, air and water contamination. Exposure to cadmium is associated with liver tumors and toxicity (Vicente-Sánchez et al., 2008). Various studies have shown that cadmium toxicity in liver seems to be crucially mediated by the production of reactive oxygen species known to induce necrosis in various rat organs (Razinger et al., 2008; Hsu et al., 2007), lipid peroxidation (Borges et al., 2008) and a decrease in antioxidant enzymes (El-Sharaky et al., 2007). Epidemiological studies have strongly suggested that diet plays an important role in the prevention of chronic diseases (Lopez-Alarcon et al., 2007). Polyphenolics, commonly found in fruits, vegetables and grains, provide chemoprotective effects to combat oxidative stress in the body and to maintain balance between oxidants and antioxidants in order to improve human health (Hsu, 2006). An imbalance caused by oxidant excess leads to oxidative stress, resulting in DNA and protein damages and increases the risk of degenerative diseases such as cáncer (Hsu, 2006). Green tea is prepared from the tea plant Camellia sinensis. The predominant flavonoids in green tea are catechins, namely epicatechin (EC), epicatechin-3-gallate (ECG), epigallocatechin (EGC), and epigallocatechin-3- gállate (EGCG) (Feng, 2006). These compounds account for up to 30-40% of the dry weight of green tea (Balentine et al, 1997). From a pharmacological perspective, EGCG has currently received the most attention by far due to its anti-oxidant, anti-inflammatory, and anti-carcinogenic effects (Shankar et al, 2007; Tipoe eíaZ, 2007). The present study was designed to assess the protective effect of green tea (GT) infusión by evaluating the free radicáis scavenging capacity using the DPPH and NBT/riboflavin in vitro. In vivo, the present paper was carried out to study the effect of green tea infusión on hepatic toxicity assessed by lipid peroxidation, enzymatic antioxidants and cell damage biomarkers in rat livers intoxicated by cadmium. Adult male Wistar rats weighing approximately 140-152g were obtained from the central pharmacy, Tunisia. They were provided with animal feed and water ad-libitum and maintained in 12h light/dark cycles at 24 ± 4°C. Animáis were divided into four groups (six rats per group) and caged separately. Group 1 (untreated control) animáis was injected sub-cutaneously with 0.9%. NaCl. Group 2 (group Cd) was injected sub-cutaneously with 20 [imoles of cadmium/kg bw/ every 3 days and applied during six months (Wallkes et al., 2000). Group 3 (group Cd + GT) was treated with cadmium and given 5% green tea extract instead of drinking water for 12 hours daily during six months. Group 4 (Group GT) was given only 5% tea for 12 hours daily. On completion of the treatments, the animáis were decapitated and the arterio-venous blood collected. After centrifugation of the blood at 1000 g, 4°C, the liver parameters (LDH, acid phosphatase, gamma-glutamyl transferase, phosphatase alkaline activities and bilirubin rate) were determined in the serum. The antioxidant enzymes activities (SOD, catalase and GPX) and the TBARs were determined in the liver extracts. Green tea was extracted using the method described elsewhere (Itharat et al., 2004) and modified in our laboratory. Briefly, the plant samples weighing about 50 g were individually extracted in llitre at 40 °C for 60 min. After filtration, the extract was kept at 4°C, prepared and given each day. For DPPH and NBT/Riboflavin tests, the aqueous extract was prepared as previously described elsewhere (Sharma et al, 2007). Briefly, green tea was collected locally and air dried, powdered and extracted with double distilled water by refluxing for 36 hr (12 x 3) at 80°C. The extract thus obtained was vacuum evaporated so as to make it into powder form. The extract was re-dissolved in double-distilled water just before analysis. The assay described by Ohinishi et al., (1994) was used to determine DPPH radical scavenging. One milliliter of DPPH solution (0.1 mM in ethanol) was mixed with 1 mi of green tea with (0-248 [ig/ml) and reacted for 30 min, before mixture absorbance was measured at 517 nm against 95% ethanol solution as the blank. 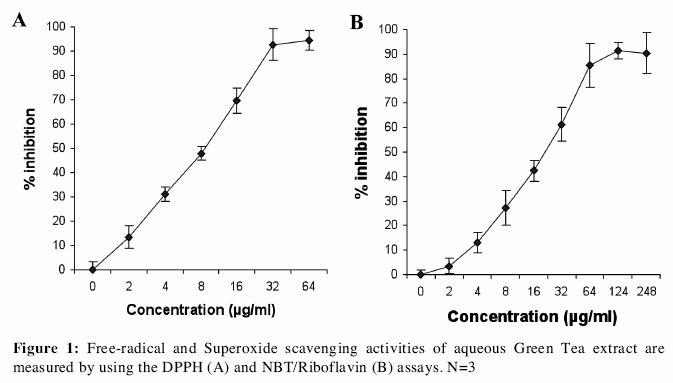 Triplícate measurements were performed and the antioxidant activity was expressed as the percentage of scavenged DPPH: Scavenging effect (%) = [(A0 -A1)/A0] x 100 where A0 and Al are the absorbance for the blank and in the presence of green tea respectively. The inhibition of superoxide radical production was evaluated using the nitroblue tetrazolium NBT.reduction method of McCord and Fridovic (1969). The reaction mixture contained: EDTA (6M), riboflavin (2 μM), NBT (50 μM), green tea extract (from 10 to 248 μg/ml) and phosphate buffer and phosphate buffer (67 mM, pH 7.8) in a final volume of 3 mi. The tubes were uniformly illuminated with an incandescent lamp for 15 min, and the optical density was measured at 530 nm before and after illumination. Lipid peroxidation in the liver and kidney was estimated colorimetrically by measuring thiobarbituric acid reactive substances (TBARS) using the methods of Buege and Aust (1984). In brief, 0.1 mi of tissue homogenate was treated with 2 mi of TBA-trichloroacetic acid-HCl reagent (0.37%TBA, 0.25MHC1 and 15%TCA, 1:1:1 ratio), placed for 15 min in a water bath and then cooled and centrifuged at 3500 xg for 10 min at room temperature. The absorbance of supernatant was measured at 535 nm against a reference blank. Valúes were expressed as mM/mg protein. Catalase (CAT) was estimated by the method of Aebi (1984). The reaction mixture contained 1.0 mi of 0.01 M phosphate buffer (pH 7.0), 0.1 mi of tissue homogenate and 0.4 mi of 50M H202. The reaction was stopped by the addition of 2.0 mi of dichromate-acetic acid reagent (5% potassium dichromate and glacial acetic acid were mixed in 1:3 ratio). Then the absorbance was read at 620 nm; CAT activity was expressed as \ÚA of H202 consumed/min/mg protein. SOD was assayed according to the technique of Marklund and Marklund (1975) based on the inhibition of the formation of nicotinamide adenine dinucleotide, phenazine methosulfate, and amino blue tetrazolium formazan. A single unit of enzyme was expressed as 50% inhibition of nitroblue tetrazolium reduction per min/mg protein. GPx activity was measured by the method described by Pagua and Valentine (1967). Briefly, the reaction mixture contained 0.2 mL of 0.4 M phosphate buffer (pH 7.0), 0.1 mL of 10 mM sodium azide, 0.2 mL of tissue homogenate (supernatant; homogenized in 0.4 M phosphatebuffer, pH 7.0), 0.2 mL of GSH, and 0.1 mL of 0.2 mM hydrogen peroxide. The contents were incubated at 37°C for 10 min. The reaction was stopped by adding 0.4 mL of 10% TCA and centrifuged. The amount of proteins was determined by the method of Lowry et al (1951) using bovine serum albumin as the standard at 660 nm. The activities of lactate dehydrogenase (LDH), gamma-glutamyl transferase (GGT), acid phosphatase (PAC), phosphatase alkaline (PAL), and bilirubin were assayed using commercial kits from Sigma (Munich, Germany) and Boehringer (Mannheim, Germany). Data are presented as means ± SEM. The determinations were performed from 6 animals per group and the differences were examined by the one-way analysis of variance (ANOVA) followed by the Fisher test (Stat View) and the significance was accepted at p<0.05. In vitro, the antioxidant activity of green tea infusión was evaluated by its ability to scavenge DPPH and NBT free radicáis. GT extract showed a scavenging activity with a percentage decrease, versus the absorbance of DPPH and NBT standard solution of 92% and 91%, respectively at a concentration of 32 and 124 μg/ml, respectively. The activities of LDH, PAC, GGT and PAL of rats at month 6 after giving cadmium were obviously higher than the levéis in the control (by 35, 55, 421, and 66%, respectively). In rats that received at the same time cadmium and GT infusión, the activities of all the enzymes increased but remained lower than those in rats that received only cadmium (by 22%, 29%, 22%, and 35% respectively). The bilirubin concentration increased by 137% in the serum of rats that received Cd. 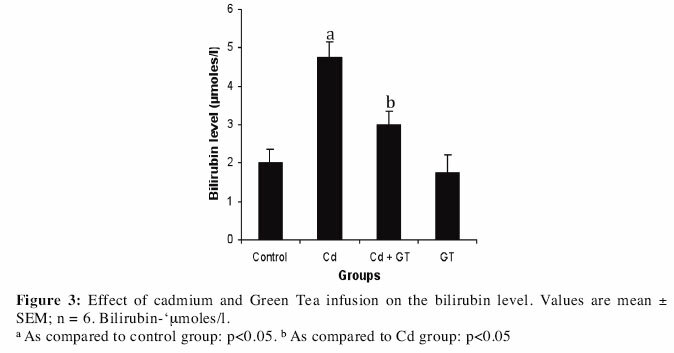 In the rats that received Cd plus green tea extract, protective effects were observed by maintaining bilirubin rate lower by 36% compared to the rats that received only Cd. The liver activities of SOD, catalase, and GPX decreased as a result of Cd administration (by 63, 47, and 29% respectively) compared to control rats. In the rats that received at the same time Cd and green tea extract a protective effect was observed. The antioxidant enzymes activities were higher (by 129, 55, and 15% respectively) compared to rats that received only Cd. Lipid peroxidation is a potential mechanism of cell injury. TBARs concentration increased by 126% in liver after six months of treatment with Cd compared to control animáis. A protective effect of green tea against the Cd-induced oxidative effects was observed. 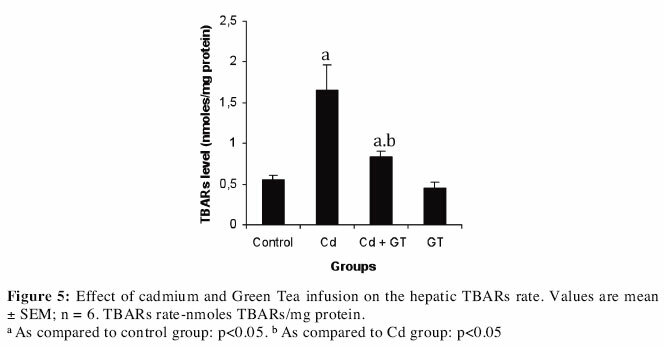 In fact, the TBARs concentration in the liver of rats that received Cd and green tea at the same time was lower by 44%. Cadmium, a heavy metal, is among the elements which are present in soils, sediments, air and water as a result of its numerous industrial uses (Razinger et al., 2008). The classification of cadmium as a human and animal toxic substance (El-Sharaky et al., 2007; IRAC. 1993) in the liver is supported by strong evidence from animal experiments. In rodents, cadmium-induced toxicity is seen in various organs, such as liver (Chater et al, 2008; Vicente-Sánchez et al., 2008). Various studies have shown that cadmium toxicity seems to be crucially mediated by the induction of cells damage in various rat organs consecutive to the production of reactive oxygen species (Kusakabe et al., 2008). Cadmium is known to induce the production of hydroxyl radicáis (Badisa et al, 2007), superoxide anions, nitric oxide and hydrogen peroxide (Rodríguez-Serrano et al., 2006). It also increases the rates of lipid peroxidation in the liver (Borges et al., 2008) and decreases the antioxidant enzymes activities (El-Sharaky et al., 2007). The results of this paper have confirmed that chronic cadmium intoxication induces a decrease in SOD, catalase and GPX activities and an increase of the TBARs rate in hepatic tissues. The imbalance between antioxidant/oxidant induced by cadmium was also observed by other authors (Eriyamremu et al, 2008), it causes an increase in hydroxyl radicáis (Liu et al, 2008; O'Brien and Salacinski, 1998)i superoxide anions, nitric oxide and hydrogen peroxide production (Liu et al, 2008; Chen et al, 2008; Hsu et al, 2007)! The free radicáis attack hepatic cells, leading to hepatic toxicity and dysfunction that are supported by the increase in LDH, GGT, PAL and PAC activities (Jamshidzadeh et al, 2008; Selmanoglu et al, 2008; Zeashan et al, 2008). The defence against long-term cadmium exposure consists of both antioxidants synthesized in the tissues and exogenous antioxidants supplied with diet. The present paper reveáis that in animáis intoxicated with cadmium, green tea partially prevenís liver dysfunction and alterations of antioxidative parameters induced by cadmium. The protective effect of green tea is connected with its components that possess scavenging free radical properties demonstrated in this study by DPPH and NBT/riboflavin in vitro tests. Indeed, flavonoids existing in tea extract enhance the expression of intracellular endogenous antioxidants such as SOD, catalase and GPX by maintaining their activities higher compared to the control treated-rats (Cd) and other antioxidants enzymes such as glutathione, glutathione reducíase, glutathione-S-reductase, and quinone reducíase (Hamden et al, 2008; Bolling et al, 2007). In fact, a direct genomic effect of tea flavonoids with estrogen responsive elements caused an induction of the enzyme antioxidant expression. (Vina et al.2005). In addition, tea flavonoids might protect against toxicity in liver through the inhibition of oxidative damage. They serve as derivatives of conjugated ring structures and hydroxyl groups that have the potential to function as in vitro antioxidants by scavenging superoxide anión (Razali et al, 2008), singlet oxygen (Almeida et al, 2008), lipid peroxy-radicals (Hsu, 2006; Alejandro, 2000), and/or stabilizing free radicáis involved in oxidative processes through hydrogenation or complexing with oxidizing species (Shahidi et al., 1992). Another mechanism proposed for protection against cáncer by dietary flavonoids may include the induction of Phase II detoxification enzymes in cells. Modification of cellular detoxification enzymes could be a major mechanism for protection against the toxic effects (Moon et al, 2005; Liu et al, 2003; Kang et al, 2003). It can be concluded that flavonoid-rich food may play a protective role against cadmium-mediated liver dysfunction and toxicity. Long-term administration with green tea inhibits lipid peroxidation and induces the activity of anti-oxidant enzymes, such as SOD, catalase, and GPX, consequently attenuating liver dysfunction by lowering increase of LDH, GGT, PAL, and PAC activities, as well as the bilirubin rate. This work was supported by the Tunisian Ministry of Higher Education and Scientific Research and Technology and the Tunisian Ministry of Public Health. We extend our thanks to Mr. Hafedh Bjaoui, an English teacher at the Sfax Faculty of Sciences for having proofread this paper. ABREVIATIONS: LDH, lactate dehydrogenase; GGT, gammaglutamyl transferase; PAC, acid phosphatase; PAL, phosphatase alkaline; TBARS, thiobarbituric acid-reactive substances; SOD, superoxide dimutase; GPX, glutathione peroxidase.